The Mayfair Moon begins in a semi-normal environment. Adria and her sister Alexandra are stuck in a home with an uncaring mother and an abusive step-father. One fateful night changes their lives as their swept away by Child Protective Services to live with their Uncle Carl, and his wife Beverlee. Not only do their lives physically change, but their personalities change, too. Alexandra, once outgoing and loving, shuts everyone out and becomes a cold-hearted girl. On the other hand, Adria finds her own circle of friends and learns to live without the close friendship of her sister. Up to this point, the story moves fast. When the mystery sets in, I feel that the story comes to an almost standstill while the reader waits for Adria to figure out, and come to terms with, what’s going on in her new town. She befriends one of the Mayfair family members and has numerous bad encounters with her sister and she’s quite clueless of the tangible danger until she’s attacked by the dark and terrifying creatures. The characters Adria comes into contact with, or is surrounded by, aren’t very memorable. Some seem so in control, despite their unpredictable nature as werewolves and others just don’t stand out to me. I haven’t been able to decide what to think of Adria. She definitely isn’t afraid to be who she is or stand up to any of the Vargas family of werewolves, but she hasn’t made a place for herself, except in the heart of Isaac Mayfair. The last few chapters of the book, however, give me reason to believe that there’s more to Adria than meets the eye. 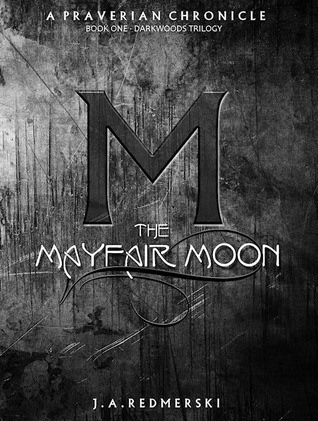 The Mayfair Moon is the kind of story that really sets up the series. I can only expect that its following sequels will be as mysterious, but also answer questions raised in book one.